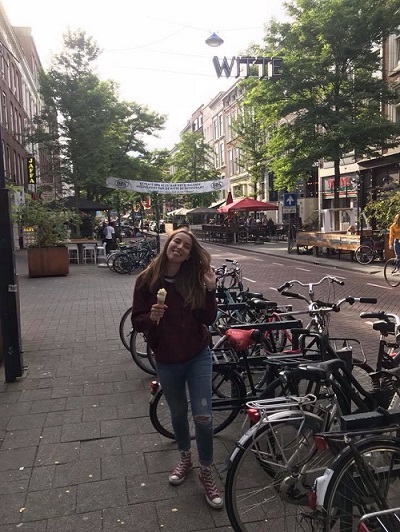 Almost became a med student in Italy, Giada Carrara has decided to take a gap year and chosen a completely different path at Rotterdam Business School, Netherlands. How so? Let's find out! Age: 19 years old. My birthday is on the 14th June. Where I’m from: I am from Italy but for the last two years I’ve been living in Winnipeg, Canada. What I study: International Business and Management. 1. Why did you choose to study International Business and Management? Initially after high school I wanted to pursue my studies in medicine, so I did an entrance exam in Italy since universities of medicine only have a specific number of places for students. I got reject by just 4 points, and after the rejection I felt like no other university was going to be right for me. I was very demotivated so I took a gap year to figure out what to do with my academic life. After thinking about it (and after many a sleepless night) and going to open days I discovered RBS. I have always been interested in marketing and international business; the strategies behind businesses fascinate me, hence why I choose international business and management. I also wanted to work in an international environment and this degree is going to prepare me to do so. It will allow me to get a job which will involve travelling to different countries to do business with them. 2. What difficulties have you encountered during the college application process? One of the main difficulties I’ve encountered in the application part of the process was when I had to send my documents to the university so that they could verify them. In my opinion, the school was not ready to receive so many documents so they had many problems respecting the deadlines that they gave us. I was supposed to get an email saying they’d checked all the documents and I’d be admitted in April but they took until June to get back to me. I was really nervous during those months and I thought they were taking so long because I’d not been given a place. Another thing that really bothered me during the application process was that every time I sent emails to their admission department they at least 10 working days to reply to me. The process was really slow. Calling them was also useless since the line was so busy that they couldn’t even help me – unless I wanted to be on hold for two hours. 3. Why did you choose Rotterdam Business School (RBS) as your destination? Starting from the fact that I already knew Rotterdam, the city where my university is, I choose RBS since in the Netherlands you can receive a high quality education for a competitive price. Moreover, they offer a lot of English language programs. Those were the main reasons I chose Rotterdam: to pursue my studies in English and to live in a multicultural city like Rotterdam. Furthermore I wanted to experience ‘city life’, since in Italy I lived in a really small town with a population of just 1,000. 4. 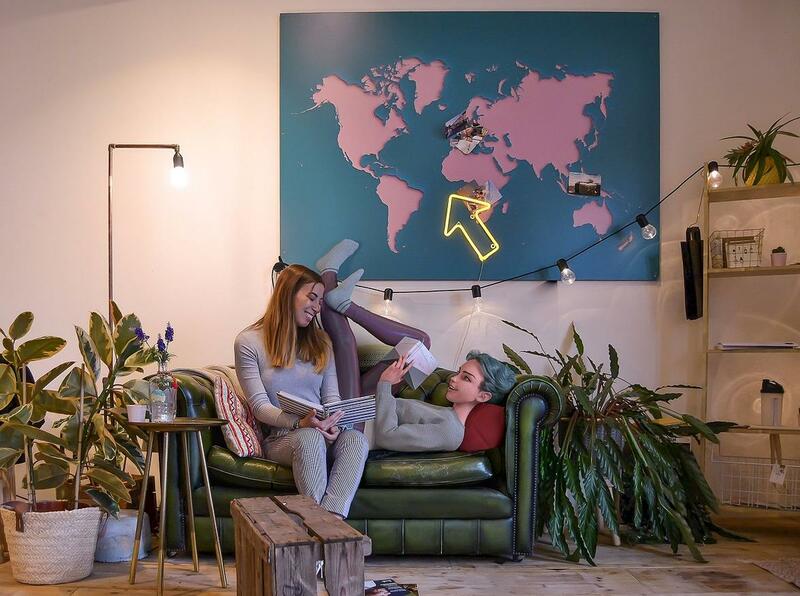 Which types of accommodation are available for the students at your university? Is it difficult to find a place to live? Finding accommodation in Rotterdam is literally hell. This city has more students than accommodation in many cases students struggle to find a room. The accommodation is also overpriced and often very small. I once I arranged a viewing for a flat and the room was 7 meters squared! The university usually offer rooms in university accommodation but they are usually given to non-European students first. Luckily I found a room but after 3 months living here I am already looking for something different. This room is located in a family apartment so it gets very noisy and it makes it really hard for me to concentrate and study. A little advice to all the students who are thinking to come here in Rotterdam: start to look for accommodation as soon as you can! 5. What do you like the most about RBS? I like the fact that in my university we have a combination of practice and theory. This combination helps me remember what I need to academically as well as instilling passion in what I am doing. Another advantage of my university is that it offers elective subjects that you can take, many electives are languages but for example, I took Neuro Linguistic Programming and it think it is cool that you can choose by your own extra subjects that can be added to your curriculum. Me and Giada at one of RBS's campuses. They are scattered all around the city so it's pretty tough to commute between campuses. 6. Describe the vibe of Rotterdam. 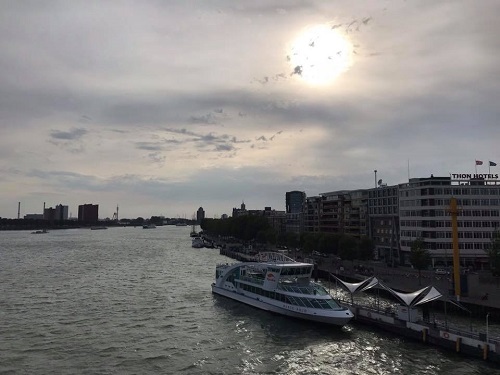 I personally feel that Rotterdam is the perfect student city; it has so much to offer, from restaurants to bars to – and these are my favourite – cafes. In Rotterdam there are countless little cafés where you can grab a nice cup of coffee and get some work done. That’s what I usually do since I can’t study at home due to the noise of the family living downstairs. There are also many libraries around the city and a big one on the Erasmus campus. The transportation is really good; we have trains, trams, buses, and metros that can take you everywhere in the city. Rotterdam is a modern city; the architecture is new and innovative. In addition, the locals say that Rotterdam is a work city and it integrates people from all over the world. This means it’s easy for us foreigner to get around just knowing how to speak English. Another good thing about this city is that finding a job is possible also if you do not speak Dutch. For example, I work at Hollister and Co. and I just speak English. 7. 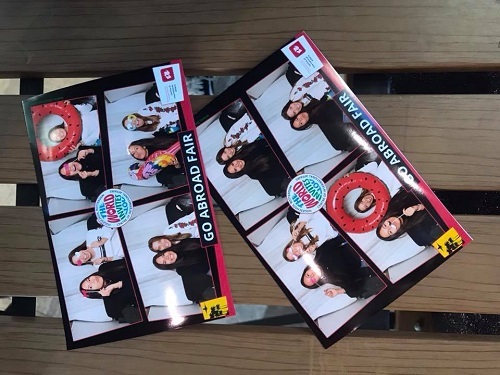 What do you usually do to have fun in your student city? There are many activities for students. There are parties around the city almost every day! Since I am not really a party girl, I usually only go once a month to these events. Generally I just hang out with my friends in bars or cinemas. There are many cozy and cool places close to the city center that are perfect to spend the night with friends at. 8. Describe the commute to school. Do you have to commute far to go to school? Here in the Netherlands everyone owns a bike, including me. I usually use my bike to get to school and it takes me 15 minutes. If it rains or it is really cold I take the tram and the metro to get to school. 9. Tell us the most memorable experience you have in your college life. At the beginning of the school year my university always has an introduction week for international students. This year on the last day we had a boat party. It was very memorable. I had so much fun with my new friends, and it was my first boast party ever. In Italy we don’t have these kinds of party and for me it was so cool to be able to see the city while we were partying. After the party my friends and I went back to one of my friend’s houses and we had a chat about our lives and got to know each other better. I think this is the most memorable experience I’ve had in Rotterdam since it was the start of my new life here in Rotterdam and I met people I’m still good friends with now. 10. What do you think your university can improve? For sure they can improve on their organization. There are so many problems arising from poor organization and scheduling. Many things are not clear even to professors and that makes it feel like a joke to us students. Clearly, they need to make some changes to make the all experience better for us. 11. On a scale of 1 to 10, how likely is it you would recommend RBS to STUDYPUNK users? I think I would give to my university a 7, but this is of course very subjective. This grade is based just on my own personal experience. 12. Anything you want to say to Ruby’s followers? If anyone of them is coming to the Netherlands for university, please look for accommodation as soon as you can, and maybe spend some extra money if you can afford it to get a good and quiet place. That will influence your studies and your mood a lot. Also, make international friends but also local friends! They will help you out when you will need them and they will be always available to help you with the language. Thanks, Giada. See you next time!